Ace's first appearance in Batman #92 (July 1955). Art by Win Mortimer and Ira Schnapp. Ace debuted in Batman #92 (cover-dated July 1955) and was created by Bill Finger and Sheldon Moldoff. Ace's creation was inspired by the success of Krypto's debut in Adventure Comics #210 (March 1955), and by German Shepherds from detective films and serials, such as Rin Tin Tin and Ace the Wonder Dog. Ace was a German Shepherd originally owned by an engraver named John Wilker. He was found by Batman and Robin after his master was kidnapped by a gang of counterfeiters. Batman used Ace to try to locate Wilker. Because he had already placed a large number of "lost dog" announcements for Ace in his civilian identity of Bruce Wayne, he was concerned that anyone recognizing Ace (who had a prominent star-shaped marking on his forehead) might make the connection between Bruce Wayne and Batman. To forestall that problem, he hastily improvised a hood-like mask for the dog that incorporated the bat-emblem as a dog tag dangling from Ace's collar. Ace was subsequently christened the Bat-Hound by a criminal the dog helped Batman to apprehend. Wilker later took a new job that made it difficult for him to take care of Ace, so he left the dog to Bruce Wayne. Wilker was never aware that Ace was the Bat-Hound or that Bruce Wayne was Batman. An early case involved Ace tracking down a mentally unhinged ancient weapons expert who was using his own weapons to commit crimes. At one point, Ace acquired superpowers thanks to Bat-Mite but this was short-lived. He did have his own training. For example; his specialized radio collar, when activated told him to don his own mask (via a hands-free device) and track down Batman and Robin. Ace was used less and less over time, and for various reasons. When Bruce was overcome with night terrors, Robin suggested Ace sleep beside him. Ace disappeared from the Batman comics after Julius Schwartz took over as editor in 1964. His last appearance[contradictory] was a cameo in a story where Batman had lost his fighting spirit. Ace made only very occasional comic book appearances[contradictory] in the years afterward. A version of Ace is seen in the cosmic realm Limbo when the hero Animal Man takes a trip through it. A modern-day version of Ace was reintroduced in Batman #462 (June 1991), although he has been rarely seen in recent years. This version was originally a guide dog belonging to a blind Native American named Black Wolf, who called him "Dog". The dog assisted Batman in fighting criminals from Black Wolf's tribe. Following Black Wolf's death, Batman adopted Dog, renaming him Ace. He did not wear a mask, nor was he ever referred to as Bat-Hound, and has the appearance of an English Mastiff with a bat-shaped dark patch on his flank. Ace has at times helped Batman on cases and is depicted to be very affectionate towards his owner and vice versa. After Batman is disabled by the villain Bane, Azrael takes over the role and ejects Ace, Nightwing, Robin and Harold Allnut from the Batcaves. Harold, a trusted confidante of Batman, takes in Ace; they live in a part of the caverns Azrael is unfamiliar with. To keep busy, Ace enjoys playing with a robotic mouse built by Harold. Ace disappeared without explanation after the events of the No Man's Land storyline in the late 1990s. He cameos in Ambush Bug: Year None. A traditional Ace was seen in Final Crisis: Superman Beyond 3D. He is in Limbo with other "forgotten characters", such as Gunfire, Geist, Hardhat of the Demolition Team and Merryman of the Inferior Five. Merryman explains everyone is here where no stories exist because nobody is writing about them. Despite this, Superman and his allies work to rescue all the residents of Limbo, who then help assist in the battle against the cosmic threat of Mandrakk. The original Ace appeared in a flashback scene in Batman Inc. #4, thus making the current canon status of the Post-Crisis Ace unclear. In this story, Ace is trying to play with Robin who is fuming over Kathy Kane, Batwoman, and her influence on Batman. In Batman and Robin Vol 1: Born to Kill, as part of The New 52 (a 2011 reboot of the DC Comics universe), Bruce is seen purchasing a black Great Dane from a kennel. He later gives this dog to his son, Damian, who names him Titus, though writer Peter Tomasi stated in an interview that he considered naming the dog Ace. Damian rejects the dog at first, but eventually bonds with him. In DC Rebirth, a different Ace was introduced in Batman Annual Vol 3 #1, in which he is depicted as a former guard dog of the Joker who fought Batman until Joker left him and the other dogs without food in the ditch to fight amongst themselves. The dogs had card symbols on them, and the brown dog with an ace on it killed the others. He was sent to the Gotham Pound, and Alfred adopted him two days later. In order to facilitate this, Alfred actually purchases the Gotham Pound, turning it into the Martha and Thomas Wayne Humane Society. Alfred spends the next couple of months training the dog despite Bruce's objections, as he thinks Ace's wounds from the Joker's actions cannot be healed. Despite this, Alfred manages to properly train him in time for Christmas, and Bruce starts bonding with the dog after getting injured during one of his night shifts. He gets Ace a bat-mask for Christmas and calls him a "Bat Hound." Though the Gotham Pound owner described Ace as a female, Bruce and Alfred have called it a him, leaving the gender ambiguous. Titus is seen as a pet living in Wayne Manor. It alerts Alfred of Duke Thomas's sneaking out. Much like the TV show Batman Beyond, a Great Dane named Ace is shown to have been owned by Bruce in his old age. In Mark Waid's and Alex Ross's Kingdom Come miniseries, Ace is portrayed as the giant winged steed of the Fourth World Batwoman. Ace is also mentioned in Howard Chaykin's Batman/Houdini crossover. During a seance attended by Bruce Wayne and mystic debunker Harry Houdini, Ace was referred to as Bruce Wayne's childhood pet. In the Frankenstein pastiche Castle of the Bat, Dr Bruce Wayne tests his theories by creating a literal Bat-Hound: a dog with some of the attributes of a bat. A version of Ace appears in multiple issues of Tiny Titans, a comic created for younger readers. Pre-Crisis, Superman's Batman-like identity of Nightwing included a Kandorian counterpart to the Bat-Hound, a telepathic dog named "Nighthound". Ace the Bat-Hound appears in Batman Beyond, with vocal effects done by Frank Welker. This version is Bruce Wayne's pet and guard dog that is a Great Dane mix. He made his first appearance in the series premiere episode "Rebirth". At first, Ace did not like Batman (Terry McGinnis), but after he and Batman were able to help each other on several missions, Terry earned Ace's affection and loyalty. The episode "Ace in the Hole" reveals Ace's origins: he was a puppy that was bought by illegal dog-fighting ring leader Ronnie Boxer but managed to escape this abusive, violent life. He soon found fellow tormented soul Bruce at Crime Alley during the anniversary of his parents' murders. After he was injured by a member of the Jokerz gang during an attempt to save Bruce from the thug, Bruce took the dog in his personal care. After encountering Boxer once again, Ace and Batman stop Boxer's attempt to use synthetic growth hormones to turn dogs into monsters. Ace also plays a role in the movie Batman Beyond: Return of the Joker when he engaged a member of the Jokerz that had been spliced with hyena DNA and then assisted Batman by attacking the Joker, which freed Batman from captivity and damaged the controls for Joker's new satellite weapon system. This version of Ace is named after Ace from the Royal Flush Gang, whom Batman comforted before her death. In Krypto the Superdog, that stars Krypto (Superman's childhood dog), Ace the Bat-Hound (voiced by Scott McNeil) makes occasional appearances and is once again a crimefighting ally of Batman—although the Dark Knight himself does not appear in the show. In this series, Ace, much like Batman, is equipped with various gadgets and equipment as an aid in his crime-fighting efforts. In one episode, he met the Dog Star Patrol and helped them find their missing member Hot Dog. His enemies include the Joker's hyenas Bud and Lou, the Penguin's trained birds (Artie the Puffin, Griff the Vulture, and Waddles the Penguin), and Catwoman's pet cat Isis (who flirts with Ace much like Catwoman flirts with Batman). Ace has a Batwoman-style glider he uses for more speed. He considers himself to be Batman's partner, rather than his pet, and becomes annoyed when someone calls him the latter. Ace the Bat-Hound appears in Batman: The Brave and the Bold, with vocal effects done by Dee Bradley Baker. In the episode "Legends of the Dark Mite! ", he helps Batman fight Catman and an endangered tiger he unleashes on Batman. Ace manages to corner Catman up a tree, and Batman rewards him with a bat-shaped treat after getting him to heel. Ace is later seen in the episode's main plot as a guise Bat-Mite created. When Batman sees two Aces, Batman knows something is wrong. At the end, Batman touches Ace's collar to see if he is a fake, but he is the real thing and tells Ace that he was just making sure. Ace makes an appearance in the episode "The Siege of Starro! Part One" where he is seen when Batman contacts Booster Gold. In the episode "The Plague of the Prototypes! ", Ace is friends with Proto (Batman's prototype Bat-Robot) and encourages him to save Batman from Black Mask. Later, using his jet-pack, he helps Batman and Proto track down and deactivate Black Mask's bombs. Ace the Bat-Hound appears in the "DC Super-Pets" sketch of DC Nation Shorts, voiced by Diedrich Bader. In Robot Chicken DC Comics Special 2: Villains in Paradise, Ace the Bat-Hound appears in a segment where he is shown barking at a dog version of Bane called Banehound who breaks Ace's back in a parody of the Batman: Knightfall storyline. The segment itself is actually a callback to the "That's Bane!" segments from the first Robot Chicken DC Comics Special where Bane repeatedly appears and breaks Batman's back. Ace the Bat-Hound appears in the Justice League Action episode "Best Day Ever". When the Joker breaks Lex Luthor out of prison in a secret attempt to steal a weapon of his, he takes the two of them to the Watchtower knowing the League will be investigating The Fortress of Solitude after figuring out they will be there. Having just escaped Krypto, they are apparently chased away by Ace, who brings proof of this to Batman by having a scrap of the Joker’s clothing. He receives a firm but respectful well done by Batman for his efforts. Ace the Bat-Hound appears in the Lego / DC animated movie Lego DC Comics Super Heroes: The Flash. He is shown to be one of the highest point ranking members of the Justice League, embarrassing former highest point scorer Cyborg. In the 2018 animated crossover film Scooby-Doo! 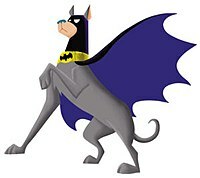 & Batman: The Brave and the Bold, Scooby-Doo dresses in an old Bat-Hound costume near the film's climax. Ace was mentioned in Lego Batman 2: DC Super Heroes. Ace the Bat-Hound appears as a playable character in Lego Batman 3: Beyond Gotham. In Injustice 2, Red Hood mentions Ace the Bat-Hound when Harley Quinn threatens to make him a chew toy for her hyenas Bud and Lou, causing Red Hood to state "Where's the Bat-Hound when I need him." referencing the antagonistic relationship between the hyenas and Ace the Bat-Hound in some media. In Batman: Arkham Knight in Bruce Wayne's office in Wayne Tower, in front of the bar, by the chair closest to the wall, can be seen a dog bowl with the name ACE inscribed. Ace the Bat-Hound appears in DC Super Hero Girls. The appeal of Ace is discussed in Mythology: The DC Comics Art of Alex Ross. Ross feels that as a child, the idea of Batman having a dog is "cool", but as an adult the same idea is "outrageous". ^ Shutt, Craig (1994). Baby Boomer Comics: The Wild, Wacky, Wonderful Comic Books of the 1960s!. Krause Publications. p. 98. ISBN 0-87349-668-X. ^ Daniels, Les (2004). Batman: The Complete History. Chronicle Books. p. 86. ISBN 0-81184-232-0. ^ Greenberger, Robert (2008). The Essential Batman Encyclopedia. Random House Digital, Inc. p. 4. ISBN 9780345501066. ^ Battaglia, Carmen (2013-04-23). "Dogs, Hollywood, and the Entertainment Industry". The Canine Chronicle. ^ Ross, Alex (2003). The DC Comics Art of Alex Ross. Pantheon Books. ISBN 978-0375422409. Modern day Ace biography at the Unofficial Guide to the DCU.